Dr T. S. Ramaswamy is a well known person in Thiruvallikkeni. He is a Senior Lawyer respected for his legal acumen and his friendly attitude towards one and all. Over the years he has endeared himself to all. He has promoted and has been part of many Socio religious groups including Probus Club, Thirumal Adiyar Kuzham and more. He has done yeoman service to Srivaishnavaites and has been a champion of Thennacharya Sampradhayam. He has successfully handled many sampradhaya related cases in Court. In his early age, he has organized coaching camps and has been instrumental in training some good cricketers. He has patronized many scholars and is always keen on doing something for the Society, especially in the field of education. Age was not a deterrent to his learning and in his 70s he completed a degree course in Vaishnavism in University of Madras. 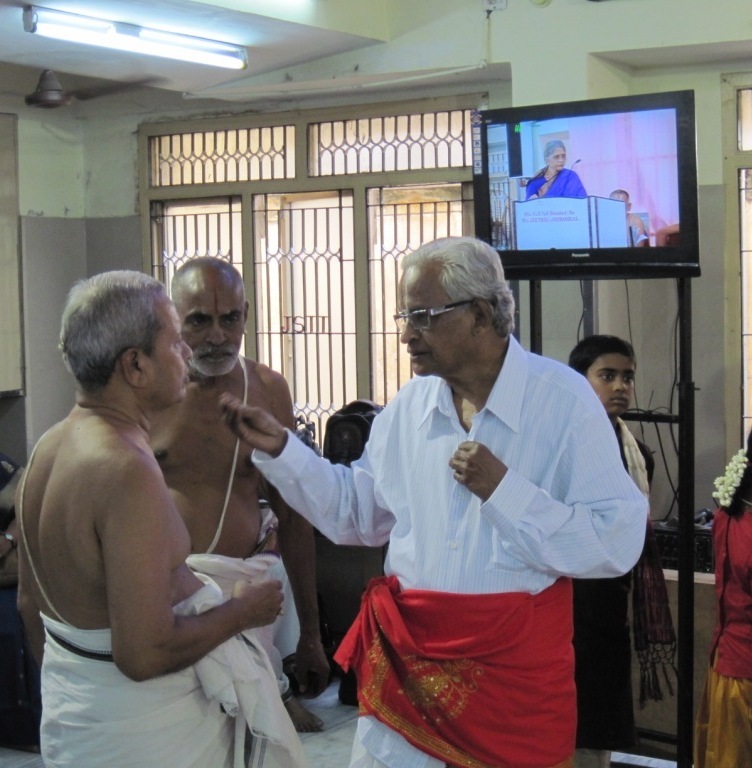 His Sadhabhishegam [81st Birthday] was celebrated at Triplicane on 3rd July & 4th July – 2011. This was attended by a large group of people which included many advocates, Sri vaishnava scholars, cricketers and locals. Whilst 4th (Monday) was intended to be the Muhurtham and more of a family function, there was grand celebration on Sunday 3rd of July. The evening started with Divya Prabhandam music by Mambalam Kothai Kuzhu. At 04.25 pm was the Mangalasasanam – a conglomeration of Saints, Scholars and others. The programme was compered by Dr Mathi Srinivasan. The programme started with prayer sung by Mrs Lakshmi Ramaswamy, wife of Dr TS Ramaswamy. 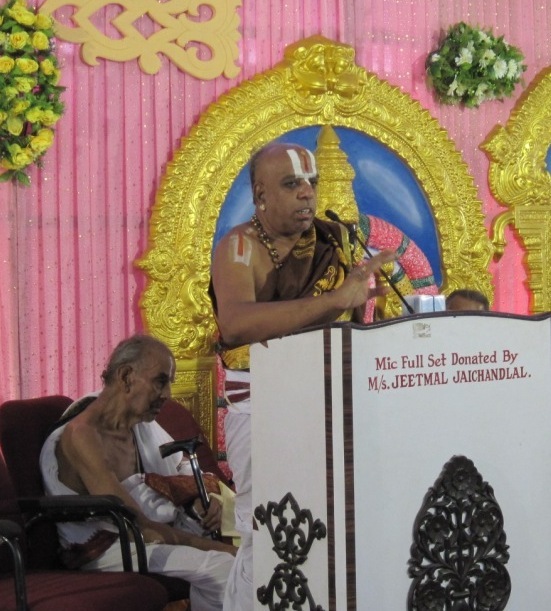 His Holiness Sri Kaliyan Vaanamalai Ramanuja Jeeyar Swami of Sriperumpudur blessed and rendered great speech highlighting the tamil in Divyaprabandham. Thirukovilur Jeeyar Swami was also present. 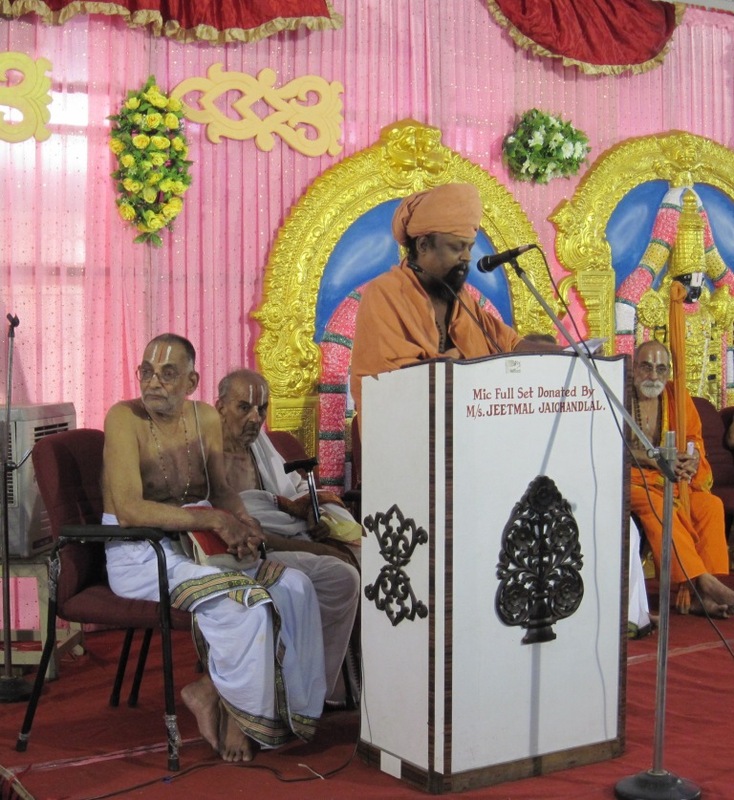 His Holiness Thavathiru Kunrakudi Ponnambala Adigalar gave special address. He mentioned about the ‘short stories collection’ written by TSR with special reference to the first story in which the advocate encounters difficulty in playing the role of a Judge for a night. 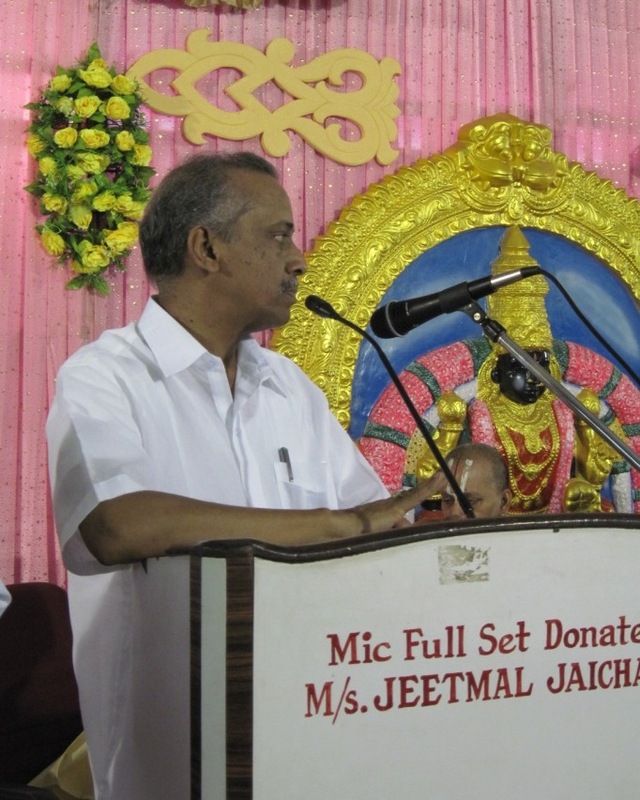 Dr MA Venkatakrishnan, Head of the Department of Vaishnavism, University of Madras and Secretary of the Adhyapaka Sabai of Sri Parthasarathi Swami temple spoke at length recalling the enthusiasm exhibited by TSR in learning vaishnavism in regular curriculum and spoke of TRS’s contributions to the sampradhayam citing his literary work which earned him the Doctorate. Hon’ble Thiru Justice V Ramasubramanian, reverred Judge of High Court of Madras spoke in his inimitable style quoting with ease Kamba Ramayanam. Many scholars including Dr VV Ramanujam, Chemistry Professor and legendary scholar in Sanskrit, U Ve Pillailokam Thalasayanathuraiyavar and many others were honoured. They were aged more than 80 [some were more than 85 and couple of them had crossed 90 even] – they were all active and their knowledge was the common binder there. TSR chose to honour them on stage. Dr Chockalingam, leading Cardiologist spoke praising TSR. Many local associations [including SYMA] and individuals also expressed their reverence and praise for TSR. It was a grand occasion for the youngsters to pay obeisance and learn lot from this noble elder. The occasion also benefitted all by the immense knowledge abounded in the speeches of the great persons who had adorned the podium. 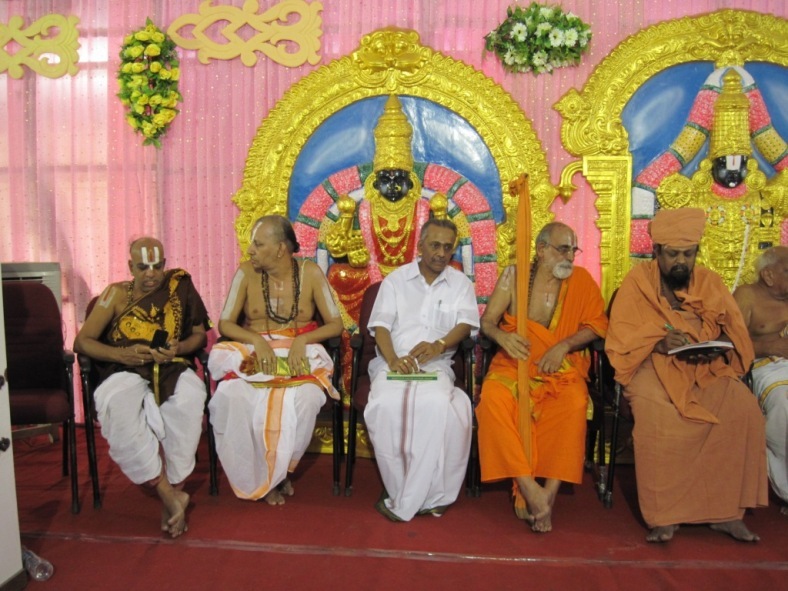 Earlier, from 9th May 2011 to 4th June 2011 – 27 days of discourse by eminent Vaishnavaite scholars had been arranged to mark this occasion. The discourses were rendered at Sri Nampillai Sannadhi at Peyalwar Kovil Street which stands renovated by the concerted efforts of Dr MAV. The discourses started with one on Thirupallandu by U. Ve. Velukkudi Krishnan Swami, followed by the likes of Sri Rajahamsam Swami, Kapisthalam Srinivasachariyar,, Dr VV Ramanujam, AV Rangachari, Thirukottiyur Mathavan Swami and culminated with the one on “Thiruvoimozhi Nootranthathi” rendered by Dr MA Venkatakrishnan. The 27 days was to have commentary on all constituents of “Naalayira Divyaprabandham including Ramanuja Nootranthathi, Upadesa Rathinamalai and Thiruvoimozhi Nootranthathi”. All 27 discourses were captured on audio and made into a single DVD for the benefit of posterity. 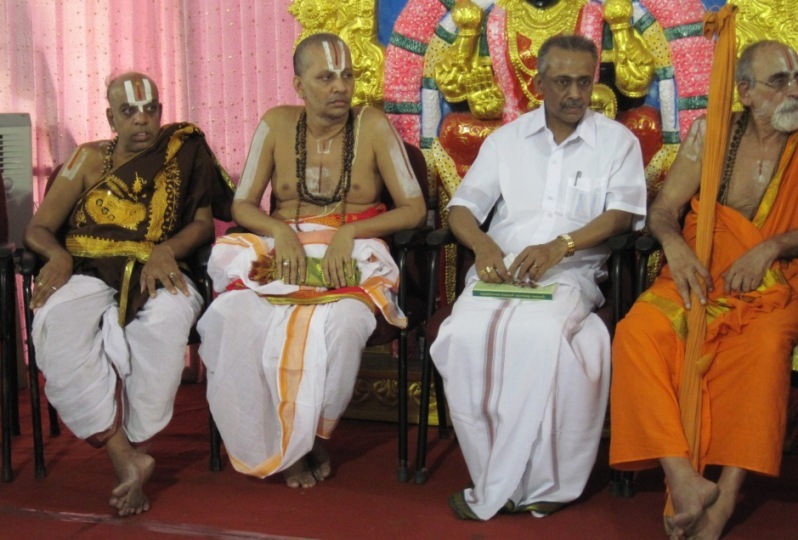 This DVD was released on stage by the HH Sri Kaliyan Vaanamalai Ramanuja Jeeyar Swami and first copies were received by Thavathiru Ponnambala Adigalar and Hon’ble Thiru Justice V Ramasubramanian. Hon’ble Thiru Justice V Ramasubramanian.